If the average night's sleep is eight hours (1/3 of a day), we sleep for about a third of our lives. If you live to be 75 years old, that's 25 years that you spend asleep in your bedroom. Woah. To put it simply, humans spend a lot of time in their bedrooms. So, it's important that a room be a relaxing and happy place. Whether it's bright colors, a modern layout or rustic decor... a bedroom should match one's style preferences. And for this exact reason, we've worked with interior designers and customers of all kinds for many years and found plenty of ways to incorporate reclaimed wood into bedrooms. 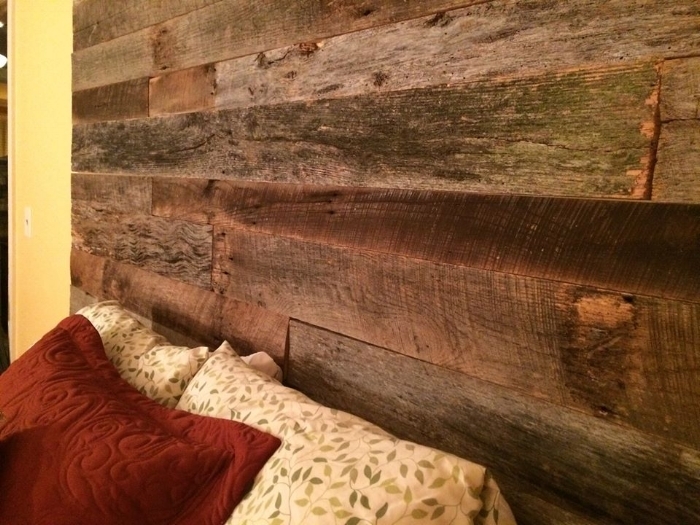 Whether it is a barn wood picture frame, or a full wall, there are a variety of ways to tastefully add some reclaimed wood into your sleeping quarters! Here are just a few examples for your inspiration. Can't have a bedroom without a bed! Add a rustic touch to where you lay your head every night with a bed or headboard made with antique lumber. Below = a platform bed and then a mixed-species headboard we built (cat sold separately!). Below are additional examples of a bed and a headboard. These were built by talented Woodstock customers with wood from our shop. Instantly add warmth and history to a room with accent wall [learn more about our accent wall here]. We love the inviting look of this sleeping space, complete with not only Woodstock accent wall, but also a live-edge bench. Big thanks to our awesome customers who send in photos like this of their finished projects. Yes, slider doors are a stylish way to add country charm to a room, but they also save space! Don't take it from us, take a page out of Terri Clark's book! A recent article in The Cottage Journal took readers on a tour of the country singer's rustic Nashville cottage, which we were excited to be a part of. "Underfoot, floors made with reclaimed wood from a tobacco barn gleam in the afternoon sun as a rich, aged scent permeates the air with a sense of history. Brent Coursey, a Tennessee craftsman of Woodstock Vintage Lumber, installed the floor and barn doors." If wood on the floors isn't for you, perhaps waking up to a unique ceiling is what you are looking for! Take a peek at this amazing tiny house by New Frontier Tiny Homes. We supplied the reclaimed oak for the ceiling. If you are looking for a smaller touch of wood, perhaps smaller accents are more your style. Here are just a few examples of barn wood decor our customers have added into their homes. These photos inspired you to renovate your own room? Have an idea for a custom project? Questions about our product or in need of a quote?